Surprisingly, she [Romero] also attempted to impugn congestion pricing in general with a strange and unfounded jab. “Several people have brought up the issue of congestion pricing,” she said, “but there has been very little mention about how equity considerations, when you look at congestion pricing on this section of I-5, would be taken into consideration.” This is an odd statement from the staffer of an agency that has a mandate from the legislature to create and implement a congestion pricing program. Of course, it’s always possible come up with an anecdote of a struggling minimum wage worker who drives an hour or more each way, always in peak hour traffic, and who would find tolls burdensome. Although, strangely, this argument seldom seems to be made about those who pay bus fare that’s the same amount regardless of income. Rather than rely on dueling anecdotes, we thought we’d take a look at the data. How do the household incomes of those who drive to work compare to those who don’t? The American Community Survey gives us a window into the commuting patterns of the nation’s workers, and lets us look at variations in family income. We’ve used the indispensable IPUMS website to extract data on commuting choices and family income for the Portland metropolitan area. The data are drawn from the five-year 2011-15 sample, and include all adults (persons aged 18 and older). First, let’s compare the family incomes of those who travel to work by car with those who either aren’t in the labor force (non-workers). On average, adults who aren’t working (including not in the labor force, unemployed, retired and students), live in households with average incomes of just under $40,000 per year; those who commute to work by car have incomes about 75 percent higher ($73,600). Similarly, those who take transit (median household income of just under $45,000) and those who walk or bike to work (median incomes of just over $42,000) have much lower incomes than those who drive to work. Overall, the median income of those who commute to work by car is more than 50 percent greater than those who aren’t workers or who travel by other modes. A second thing to keep in mind is that congestion pricing programs invariably charge higher fees to those who travel at peak travel times. But many workers, especially those with lower wages, don’t work a regular 9 to 5 schedule, and as a result, don’t travel during peak hours. 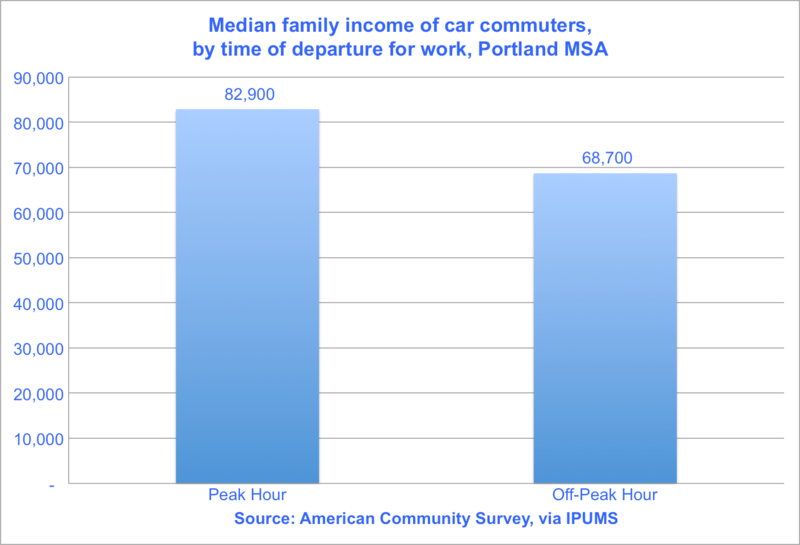 For this analysis, we examine only those who commute to work by car — our objective here being to sort out the relative incomes of peak hour car commuters compared to those who drive to work at non-peak hours. The median family income of those who drive at the peak hour (estimated from the morning peak) is nearly $83,000, about 20 percent higher than for those who drive to work at other hours. These data suggest that peak hour road pricing predominantly affects those with the highest incomes. Those who don’t work, who travel to work by walking, cycling or transit, and those who commute to work in off-peak hours have incomes that are significantly lower than peak hour road users. Its also important to note that accommodating peak hour drivers is the most expensive component of the transportation system: One of the most unfair aspects of our current system of paying for roads is that it charges everyone the same amount, regardless of whether they use the road when its congested or whether they use it when few people are on the road. A system that shifts more of the cost of the road system to peak hour users is fairer and more progressive than one that ignores mode and time of travel, as today’s road finance system largely does. Far from being inequitable, peak hour pricing asks those who place the greatest demand on the transportation system and have the highest ability to pay, to take financial responsibility. That, more or less, is the definition of fairness. Eh, income study may be reasonable for Portland but it wouldn’t apply to Phoenix which has a First in Class freeway system with zero tolled lanes that are widely used by everybody. If the tolling system uses a transponder like Washington’s Good to Go, we could also issue special transponders to the low-income that charge them less, like we do currently with our bus passes. When discussing this issue I hate using stats. Why? Because the people you are talking about harming (the lower income drivers) are below the mean. That’s the definition of the mean! And yes, society *could* use transponders to charge low-income folks less. That would be great. But I see nothing in Seattle’s use of transponders, nor being discussed seriously, to do that. In fact, it seems that the price is trending up, if I’m not mistaken. My assumption is that low income people who have to go to the Eastside and can’t fit into a standard schedule (say 9 to 4 or 9 to 7) are still going to drive, and probably do so by driving down to I-90. It’s still cheaper to drive your car down to I-90 than part with what may be your lunch money. Or your kids lunch money. Is Portland’s ‘Congestion Pricing’ Plan Any Good? Portland wants to put a price on driving on downtown freeways at rush hour. But it will need the Feds' approval. The old political instinct to cram more cars through cities never dies - not even in Portland.